Artyom (not his real name), a successful IT pro from Minsk, could afford a vacation in the Philippines or Goa, but instead went to the Chernobyl Exclusion Zone. For a few days, he stayed in a derelict apartment in Pripyat, drank filtered water from a river and walked upon rooftops admiring the sunset and the lights of the new dome built over the Chernobyl Nuclear Power Plant. I am publishing his story of this risky 5-day trip. These days, a completely legal opportunity to visit the Chernobyl Exclusion Zone is available. Official tours take you along strictly fixed routes, and it’s forbidden to deviate from them. If you want, for example, to go inside a residential building, you won’t be allowed to do it. But what’s the fun in strolling around well-trodden places that can be seen in multiple photos all across the Internet? We wanted to see another side of the Zone, the non-tourist one. After browsing through some websites and social networks, we found a guide. He agreed to take us to Pripyat avoiding police patrols, show us to an apartment and take us around various places. We knew quite well that such a tour is illegal. When we crossed the barbed wire fence we automatically became lawbreakers. What were the sanctions that we were facing? Trespassing into the Exclusion Zone is considered an administrative offense in Ukraine and is punished with a 400 grivna fine (approx. 15 USD). After making all the necessary arrangements with our guide, we bought train tickets to Kiev. And, of course, I was stupid enough to dress up as if I was going to war. I was wearing a Bundeswehr parka, camouflage pants and had chemical protection boots, thermal underwear, a portable stove, a sleeping bag and a water filtering device in my backpack. The customs officers had a lot of questions to ask about where I was going and why. From Kiev, we took a bus to a small town of Ivankov. When it got dark, we took a taxi to a half-abandoned village on the border of the 30-kilometer Exclusion Zone. That was where we got across the barbed wire fence at night. Our guide was a man with a great passion for the Zone, who knew nearly everything about it. He had taken groups of tourists into the Zone about 50 times and he knew very well where it was possible to get through and where it was too risky. He also had a feeling for police patrols. We infiltrated the site in a careful manner and stayed unnoticed during the whole 5-day trip. During the first two hours we were trudging through a moor, where I was extremely unlucky: I lost my sleeping bag. We tried to find it, but it was pointless. We only got tired and wasted an hour and a half. What was I to do? You can’t light fires: the place is contaminated with radiation, and the temperatures were supposed to drop below freezing at night, according to forecasts. The first thought was to turn back, but then I just gave up on it: hell with it! I’m not a newbie at hiking and I’ve been in far more dangerous situations. Moving forward, we saw piles of sawn down trees along the roads. I don’t know if that’s legal. Our guide told us that lumberjacks work in the Zone officially. Well, there is probably nothing wrong with this way of harvesting timber if it is conducted under control and the produce is then checked for radiation contamination. Scrap metal hunters and mushroom and berry gatherers are a completely different story. They still work in the Zone and our guide has met with them a few times. Having walked about 12 km (8 miles) in the first night, we spent the night in an abandoned village. Our guide has a night sheltel equipped there — mattresses, some furniture. We spent the whole day in the village. It is dangerous to move along the roads at that time of day. It is possible to run into all kinds of people: the police, people who work in the Zone, forest rangers. We saw the remains of collective farm buildings and greenhouses, rusty combine harvester frameworks, truck cabins. The local grain depot turned out to be a copy of one of the S.T.A.L.K.E.R. game series locations. From time to time I asked our guide when the high radiation levels were going to start. During the first day our measuring device did not detect anything higher than normal. 0,12, 0,15, 0,2 microsievert per hour – not higher that in Minsk. Our guide said “now you can turn on your radiation meter” only at night, when we approached the infamous Red Forest that absorbed the most part of the radioactive dust emissions. During the decontamination the forest was bulldozed and new trees were planted in its place. However, the tree trunks buried in the ground still emit high levels of radiation. 4, 6, 8 microsievert per hour — the levels grew with each step, rushing us on. It is a well-known fact that you cannot feel radiation, and that makes you uncomfortable. After coming out of the forest, we took the road leading straight to the “Jupiter” factory. At that time our water supply was coming to an end. We filled up the empty bottles at the factory, where our guide showed us a utility vault flooded wih groundwater. When we got to the apartment, we filteres the water and boiled it using a portable stove. Then it was drinkable. Every guide in Pripyat has one or more apartments for hosting tourists. What does this accommodation look like? The ceiling doesn’t have leaks; there are doors and windows in at least one of the rooms, a few beds with mattresses, wardrobes and nightstands – a basic set of furniture. The wallpaper is usually fixed to the walls and doesn’t hang. In the whole town there is about a hundred apartments like this. If the police find one of the staging bases, they include the apartment in their patrol route. That’s why the guides have to keep looking for new places to stay for the night. These stalker apartments are thoroughly guarded: when dusk falls, the windows are covered with black plastic bags so that the light of the candles and flashlights doesn’t get through and give away the presence of people inside. The bathroom is either on the balconies, where everything is washed off by rain, or in the apartments located a few floors up or down. So, the stalkers’ “lairs” can be recognized by the distinctive smell. After checking in, we went up to the roof, where an impressive view opens towards the Chernobyl Nuclear Power Plant and the new 4th reactor shelter. Sleeping in an abandoned apartment block is quite creepy. There are windows and doors creaking and pounding all over the building, some clanking noises in the elevator shafts. After three decades without people the town almost dissolved into the forest. You are walking down a narrow asphalt path – and it turns out that used to be an avenue. Suddenly you see a streetlight surrounded by trees that looks completely out of place. You step off a road to the side and an entrance to a grey apartment block appears from behind the trees. The stands, the light posts and a running track are all that’s left of the local soccer stadium. Where once a ball was being kicked around, there is now a 9-storey tall forest. This is what the passenger boat terminal at the quay looks like now. Near the quay, the former “Pripyat” cafe is situated. Next to one of the walls there are rusty soda machines. Inside one of local schools. In the town’s amusement park bumper cars and a ferris wheel are rusting away. This place is not considered the safest. In 1986 helicopters that dispatched lead into the burning reactor were landing not far from here. The radiation meter gives a deceiving feeling of safety, displaying only 0,62 — 0,71 microsievert per hour. This is about 3 – 3,5 times higher than normal. The moss, known for its ability to absorb radiation, shows about 2 microsievert per hour – 10 times higher that normal. 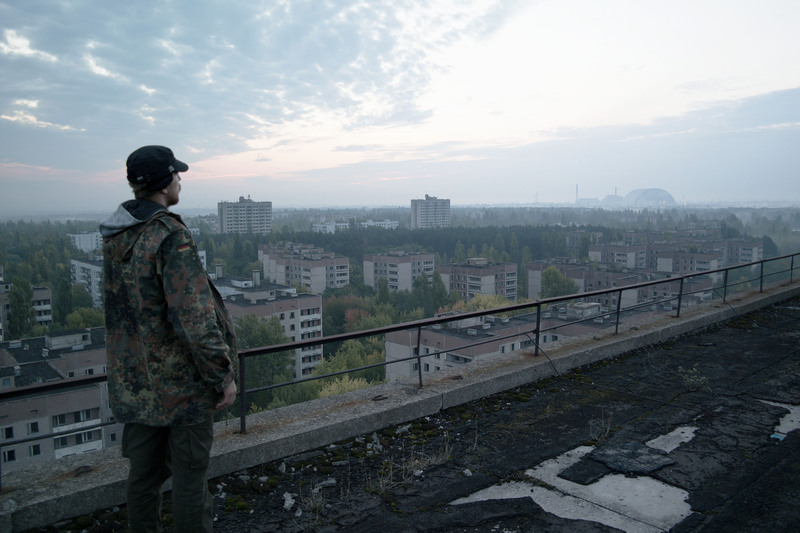 — Before the trip I had thought that I would probably feel uncomfortable in Pripyat. In my imagination, I saw gloomy images of a ghost town. But the truth is, I’d never felt as peaceful as here. There are no phone calls, no internet, no industrial noise. Clean air, bright stars and the victory of nature over civilization. I had some time to be alone with myself and think about things. One of the most contaminated objects in Pripyat is the medical unit №126. More specifically, its small basement. In the first days after the disaster firemen were brought to this medical unit who had received lethal doses of radiation. Their clothes, literally glowing from contamination, were thrown into the basement. Among the explorers of Pripyat there are those who risk going down there once in a while. Their white protective clothing and gloves are scattered on the floors on the ground level of the building. — Disaster liquidators’ clothes are still down there. It is basically a sacred place for fanatic stalkers. They go down to the basement to see everything with their own eyes and pay homage to the heroism of those who were the first to face the consequences of the radioactive blast – Artem says, – I decided not to take the risk. You can inhale some radioactive dust, and it will keep poisoning you for a while after that. Regular gas masks will not protect you from this kind of dust. For me, just touching one of the firefighter’s fire hoods was enough. The radiation meter indicated a level of more than 50 microsievert per hour. We left Pripyat at night to head to the place where we were to be picked up under the cover of darkness. Then we spent about an hour or more at the edge of a forest. The contamination level at that place fluctuated between 4,5 and 9 microsievert per hour. Then we heard the sound of an engine. We didn’t know who was coming, so we ran into the forest to hide. There the contamination level soared to 20 microsievert – a hundred times higher than normal. We went back right away. Whoever it was in the car, we didn’t care if they noticed us – health was more important. You are probably wondering if I have received a great dose of radiation. According to the meter data, in the end I got a third of what you get during an X-ray. This does not in any way mean that the Zone is safe. We had an experienced stalker with us, who knew all the places that had high contamination levels. That’s why everything ended quite well, except for the lost sleeping bag and blistered feet. It’s not recommended to go there alone. You want to know of I want to visit Pripyat again? I answered this question for myself a while ago. The Zone… It keeps calling you back.